Next time you watch Superbowl, think Advanced Pricing! This case study describes Purchasing and Advanced Pricing integration (and its limitations) and how we modeled complex pricing agreements using standard functionality. Programming content expenses for various content providers such as CNN, HBO, Showtime, etc. is the largest components of service costs for cable companies. Content providers (vendors) are paid based on complex pricing contracts that use a variety of business metrics, such as number of subscribers, market penetration, market segment, carriage channel, bundling with other channels, proximity to other channels, service types, special events (such as Olympics) etc., to determine programming cost that are owed to content vendors. Essentially these programming contracts are complex procurement pricing agreement with various vendors. This white paper describes implementation of complex procurement pricing agreements using the newly delivered integration between Purchasing and Advanced Pricing modules. Mediacom is the nation’s eighth largest cable television company based on basic subscribers, and among the leading cable operators focused on serving the smaller cities and towns in the United States. Its cable systems pass an estimated 2.8 million homes and served 1.4 million basic video subscribers in 23 states. Programming content expenses for various content providers such as CNN, HBO, Showtime, etc. is the largest components of service costs for Mediacom. A critical part of cable provider’s future success relies on how well it can evaluate programming costs and leverage that information to build the most-compelling collections of services. Content providers (vendors) are paid based on complex pricing contracts that use a variety of business metrics to determine programming cost that are owed to content vendors. The following lists some of these metrics that needed to be addressed. Clearly with base PO functionality which supports flat rate or volume discounts (quantity discounts) only cannot support complex pricing agreements such as these. However, with the newly released integration with Advance Pricing, it becomes a much more attractive option to look at. Mediacom was using Navision as the core financial system. Most of the programming calculations were offline and took approx 3 FTE to complete on a monthly basis. The company had grown substantially since Navision implementation and Navision has started to become a bottleneck in monthly processing. Since Oracle EBS is the de-facto standard in cable industry, Mediacom selected Oracle EBS 11.5.10 to replace Navision. As part of the financials implementation Mediacom looking at significantly automating programming payment processing to achieve better control and more manageability. The goal was to design a process that was scalable, to support increase in processing volume, and adaptable, to changing business landscape. It was expected that efficiencies achieved will allow existing staff to dedicate more time to value added tasks. 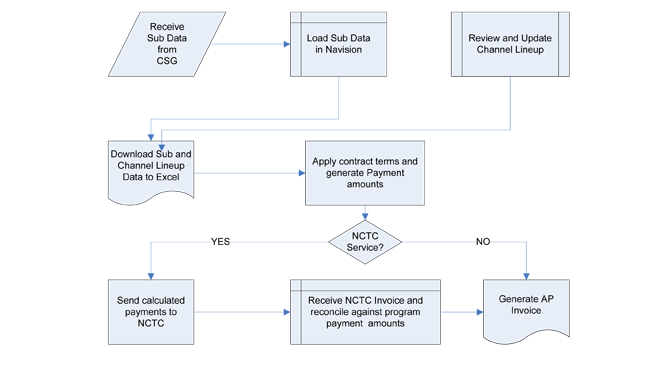 The following diagram shows high level process flow for the programming payment. In the diagram below, Sub stands for “Subscriber.” CSG is the third party order entry and billing system used for cable subscribers. National Cable Television Cooperative is a programming buying cooperative representing approximately 1100 cable operators. The following diagram shows the proposed process with PO and QP integration. The processes within the shaded portion are part of base EBS functionality and the processes outside the shaded portions are staging tables in a custom schema. 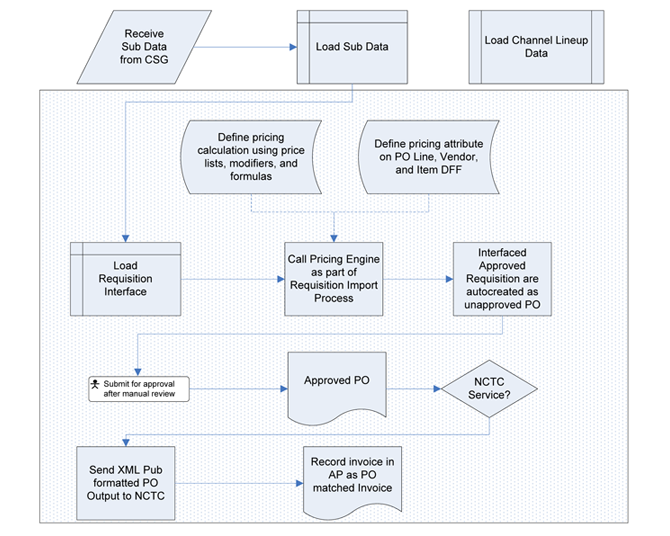 The unique nature of royalty payment process is that supplier does not really have the information necessary to generate an invoice. As a result, Mediacom generates the invoice is generated internally for payment. The calculation output is sent to the suppliers as supporting documents for payments. The following describes the conceptual data model for key configuration elements that need to be addressed for this process. 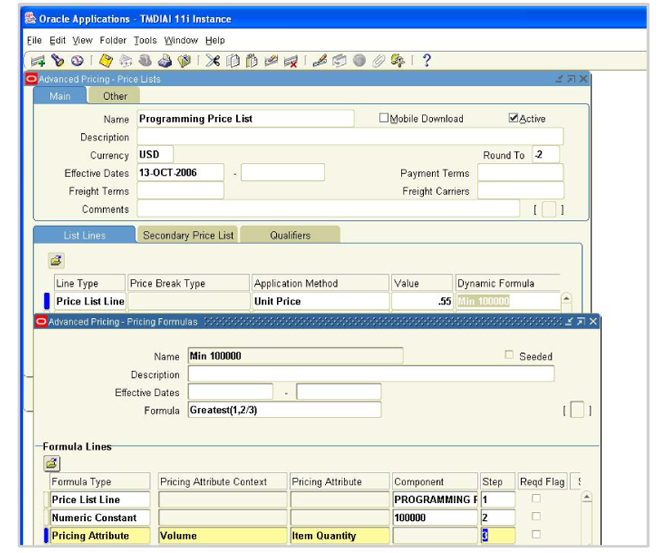 This profile option identifies which Oracle software application can use Oracle Pricing. This profile option was set to “Purchasing” at the application level. 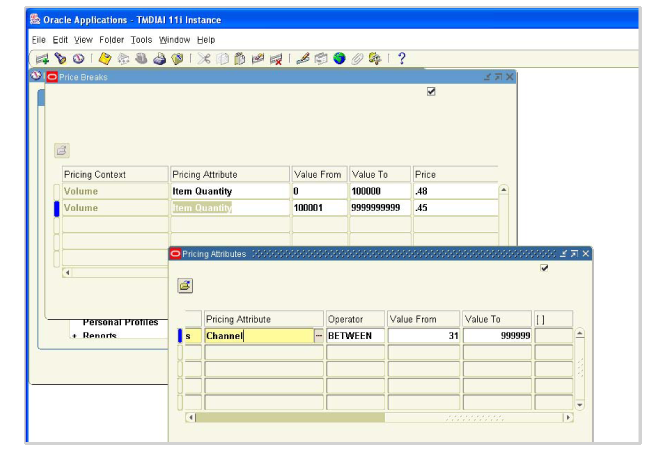 This profile option indicates the current Pricing Transaction Entity (PTE) in use. Only those contexts and attributes assigned to the current Pricing Transaction Entity will be available in the list of values onthe setup forms. Likewise, querying up setup data for price list lines, modifiers, and qualifiers, etc. will cause the description to be shown only for those contexts and attributes that are assigned to the current Pricing Tansaction Enttity. This profile was set to “Procurement” at application level. This profile option determines the Round To value that is defaulted on the price list. The rounding factor is limited by the number of positions allowed in the standard extended precision format of the price list currency. This was set to “Extended” to enable unit price rounding to five (5) digits after decimal point. Most Mediacom contracts calculation require using unit price that are four (4) digits after decimal point. 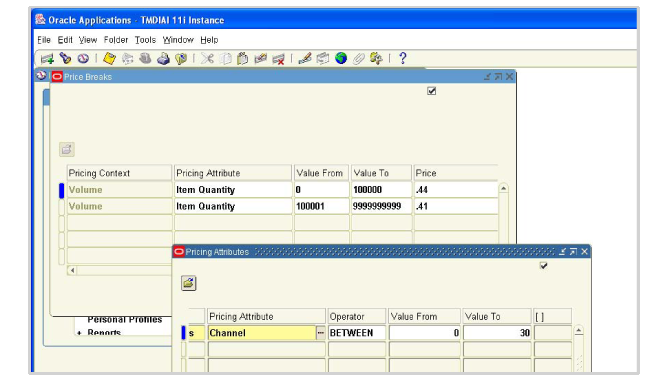 Oracle Purchasing calls advanced pricing engine only if a contract purchase order is used as sourcing document. Therefore, a contract purchase order was created for each supplier along with approprate ASL and sourcing rules so that items are sourced correctly during requisition import. A sample contract of this type is summarized below. If service is carried on channel number 30 and below, the following rate structure applies. If service is carried on channel number 31 and above, the following rate structure applies. $ 0.55 per sub subject to a minimum payment of $100,000. No maximum limit. 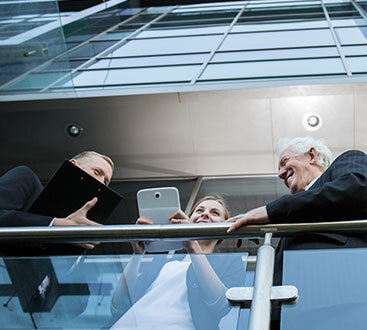 Procurement end of pricing contract has always been as complex as the ordering end, and as a result, lack of ability to implement complex pricing agreement using seeded functionality has been a major a limitation of the Oracle Purchasing product. Ability to call advanced pricing engine for purchasing is an important milestone in the maturity of Oracle purchasing product. Several limitations still continue to exist in the product and we hope that Oracle will continue to add new functionality available via this integration. Release 12 promises to enhance this integration to blanket purchase orders and Oracle will be well advised to back-port this functionality to release 11.5.10.2. In addition, in spite of the available workaround, limitation around global data structure may limit usage in certain organizations. Glenn is Senior Director of Programming at Mediacom. In this role, Glenn is responsible for managing and negotiating contracts and pricing agreements with various service providers (“programmers” as they are called in cable business). Glenn served as process owner and subject matter expert for this engagement. Glenn can be reached at ggoldmith@mediacomcc.com. Abhishek is a partner with Ideametrics. He is specialist in cable, and utility industries. He has advised various clients on design of their capex, procurement, and asset management processes. Abhishek served as solution designer and project manager for this project. Abhishek can be reached at achandan@ideametrics.com.